"A drunk man will find his way home, but a drunk bird may get lost forever." -- Shizuo Kakutani. 2019.4.26. Probabilistic aspects of persistent homology, AIP数学系合同日本橋セミナー, RIKEN AIP, Tokyo. 2018.6.26-6.29. Limit theorems for persistence diagrams, The 5th Institute of Mathematical Statistics, Asia Pacific Rim Meeting, , National University of Singapore. 2018.10.24-25. Limit theorems for random analytic functions and their zeros, 「確率・ 統計・ 行列ワークショップ 彦根 2018」, Hikone, Shiga. 2018.11.5-8. 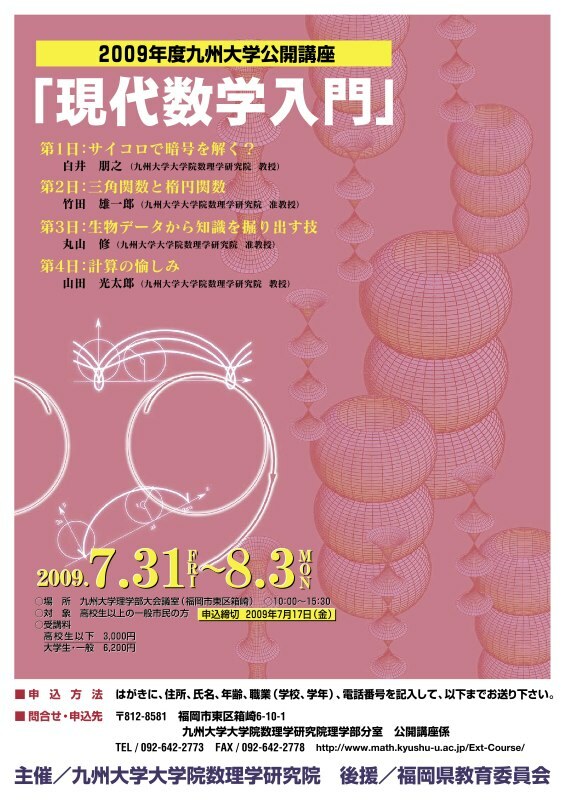 Universality of determinantal point processes on Riemannian manifolds, 研究集会「大規模相互作用系の確率解析」, RIMS, Kyoto. 2018.12.21. Dynamic determinantal point processes, Ajou-Kyushu joint workshop on Industrial Mathematics at IMI, Kyushu Univ. 2017.6.1-6.3. Determinantal point processes associated with extended kernels and spanning trees on series-parallel graphs, Function theory and dynamics of point processes, Euler International Mathematical Institute, St. Petersburg, Russia. 2017.7.14. Limit theorem for persistence diagrams, Kyushu Probability seminar at Kyushu University. 2017.8.21-25. Determinantal point processes associated with de Branges spaces, Various Aspects of Multiple Zeta Functions Nagoya University. 2017.9.4--8. "Limit theorems for persistence diagrams", the Japanese-German Open Conference on Stochastic Analysis (JP-GER Conference 2017) TU Kaiserslautern, Germany. 2016.6.19-24. Persistent homology and minimum spanning acycle for certain random complexes, Workshop on "High-Dimensional Expanders 2016" , in Les Diablerets, Switzerland. 2015.11.18 「ランダム複体とパーシステントホモロジー」 岡山大数学教室談話会 兼 岡山解析・確率論セミナー "パーシステントホモロジーと確率論"
2016.1.27. Topological Data Analysis -- persitent homology --, Institute Interest Seminar Series @I2CNER , Kyushu Univ. Japan-Netherlands seminar, 2019, May. 27th -- 31th, at Leiden University, the Netherlands. RIMS International Project Research 2012: Discrete Geometric Analysis: "Markov Chains on Graphs and Related Topics"